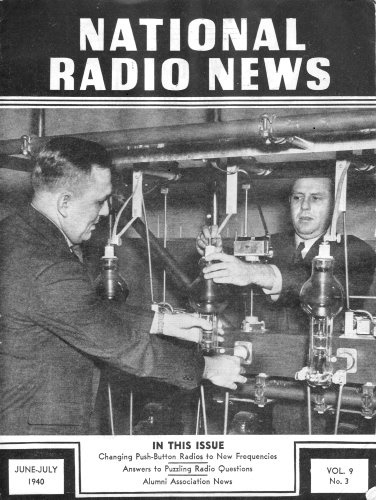 Both funny and ridiculous I thought as I read this article from a 1940 edition of National Radio News where author Julius Aceves, a consulting radio engineer, makes the case for not buying a newfangled, cheap radio that is supplied with a built-in antenna when using a good old-fashioned outdoor antenna is the better option. It's not that he doesn't have a valid point about the larger, obstruction-free outdoor antenna providing superior signal strength and a greater signal-to-noise ratio; it's that part of his argument is that in doing so you are denying the outdoor radio antenna companies revenue. That mindset is akin to telling people they should not buy notebook computers because in doing so you are denying computer monitor and keyboard manufacturers their rightful sales volumes. He does, to his credit, finally admit that there are "a few well-engineered antenna kits" that are worth consideration if you insist on taking food from the mouths of antenna salesmen's children. As you probably know, it is rare to find a radio today that does not have at least an internal AM antenna, often with no provision for any type of external antenna connection. Most radios do offer a connection point for an external FM antenna, however. A common method for effecting a cheap FM antenna is to use the AC line cord as the antenna or, in the case of a portable device like a smartphone, the ear bud wires from the antenna. Higher end models, like my nifty Tesslor R601S vacuum tube radio and my Sangean WR-2, are supplied with internal antennas and connection points for both AM and FM external antennas. Loops and indoor antennas have a definite place in the radio industry, but a good outdoor antenna system is still tops when it comes to picking up distant stations and keeping noise interference at an absolute minimum. 11 West 42nd St., New York, N. Y. To one who has specialized for years in signal pick-up and interference elimination technique, the recent attempts to do away with outdoor antennas are something truly to cry about. Indeed, we are going backwards in our radio reception when we get away from noise-reducing outdoor antennas in favor of loops and built-in antennas for operation of moderate-priced and high-fidelity receivers. Convenient and cheap as these antenna substitutes may be, they cannot and do not take the place of the noise-reducing outdoor antenna, in providing for optimum performance from a broadcast receiver. To prove that point is the purpose of the following dissertation. Also, from your standpoint as a Radiotrician this antenna-substitute trend is far more than an academic question. It means dollars and cents out of your pocket. For every time a set with loop or indoor antenna is sold, it means the elimination of one more revenue-producer for the service trade. Antenna installations, check-up and repair jobs are "gone with the wind" when antenna-less sets sweep into popularity. Hence it's your concern, too, that the public be educated with regard to the superior results which an outdoor antenna will always provide. First, let's be perfectly frank about this whole matter. We'll concede at the start that there is a definite place for the loop and built-in antenna. Technically, the self-contained signal interceptor is perfectly legitimate for portable sets. Also for tiny midgets that may be transported from room to room, or that may be used in temporary quarters such as hotel room, school dormitory or hospital. Economically, in the face of midgets selling for $10 or less, the built-in signal interceptor is again legitimate and even essential. No midget-set buyer is going to spend a few dollars extra for an outdoor antenna, especially in metropolitan areas close to powerful broadcast stations. Meanwhile, the limited tone quality of these bargain-basement sets is such that one or two more handicaps don't mean much, anyway. Turning to better-grade radio sets, the self-contained interceptor is quite another matter. Technically, the loop, built-in antenna or indoor antenna decidedly handicaps set performance, as we shall presently prove. Economically, such a set owner can well afford another few dollars if much superior results can be obtained. So our interest is primarily in better-grade sets. Fig. 1. 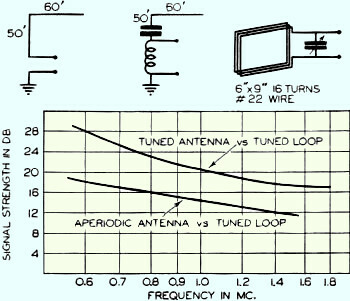 Signal strength of tuned and untuned antenna compared with a tuned loop. Fig. 2. Comparison of performance of a noise-reducing system with conventional antenna of same dimensions. Radio waves have two components: electrostatic and electromagnetic. The device picking up these waves may be actuated mainly by one or the other. Accordingly, we have a collector of the open antenna or the shielded loop type. The loop being a directional device, we can get maxima or minima by rotating it in space. Thus, we can differentiate between two waves coming from different directions. One wave may be that of a desired station; the other, a source of interference. Better reception is obtained by turning the loop against the interference source rather than for maximum signal reception. By shielding the loop, we practically eliminate the electrostatic component and receive by means of the electromagnetic, with maximum directional effect. All of this sounds ideal. In localities where radiated interference is very low and signal strength fair, the loop may be satisfactory at least in the broadcast band. Foreign stations in the short-wave bands from 49 meters down to 16, cannot be received with the same broadcast loop because of tuning-range difficulties. Also, since the field strength of overseas stations is usually low, they cannot be heard well even on a special short-wave loop under normal circumstances. The same applies to ultra-high-frequency reception. Television reception is out of the question. For signal pick-up, the loop is no better than an in­door antenna. A shielded loop, however, gives better discrimination against noise than an in­door antenna. Most horn are none too happily situated with regard to low interference level and high signal level. The radio set may be surrounded by inductive interference or so-called "man-made static." There are motors with sparking brushes, interrupters in thermostatic controls, electric bells, dial telephones, contactors for elevators, and so on. There may be that arch terror of radio noises, diathermy apparatus. Outside, there may be neon or other gaseous-tube type electric signs, or even incandescent lamp signs with motor-driven contactors. A trolley line nearby doesn't help matters. Neither does a high-tension transmission line with leaky insulators or transformers. How can the loop take care of this situation? If oriented for a minimum (or even a "null") for one source, it is not going to help noises from other directions. Moreover, it is well known that the induced voltage in a loop is very weak in comparison with the electromotive force from an open antenna, even of the indoor type. Therefore, when receiving from stations other than locals, we are going to get tube noises; unless the receiver is extremely sensitive, the automatic volume control cannot take care of fading. What to do? Can a well-designed outdoor antenna system really reduce background noises and increase signal strength in a typically poor radio location? The answer is decidedly yes. You may be skeptical. Other servicemen have become skeptical. During the last half-dozen years, the market has been flooded with so-called "noiseless antenna kits." Fantastic claims of noise-reducing properties have been made without proper foundation. It is a safe guess to say that more than 75% of such kits failed to reduce noise as compared with ordinary antenna wire, in any worth while degree to justify the claims. Frankly speaking, there have been many "phonies" marketed, which have given a big shiny black eye to this antenna-kit business. 1. Neutralizing the interference pick-up from the line connecting the antenna proper with the radio receiver, and preventing the passage of spurious currents from the power line into the input circuit of the radio receiver. 2. Increasing the signal strength by maximum pick-up of the intercepted radio waves. 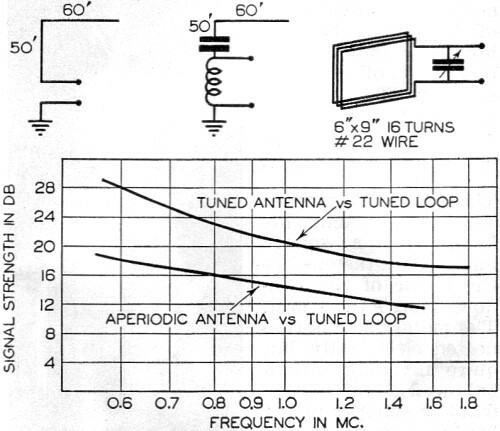 Figure 1 shows a typical instance of relative signal levels from a tuned loop vs. an outdoor antenna of the tuned and untuned types. From these graphs, the superiority of the antenna over the loop for signal strength alone is apparent. Curves A, Band C in Fig. 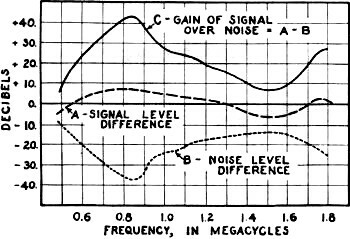 2 represent: A, the signal-level difference; B, the noise-level difference; C, the signal-to-noise logarithmic ratio (curve A minus curve B), for a certain noise-reducing antenna kit on the market, as compared to an ordinary outdoor antenna and downlead of same dimensions. 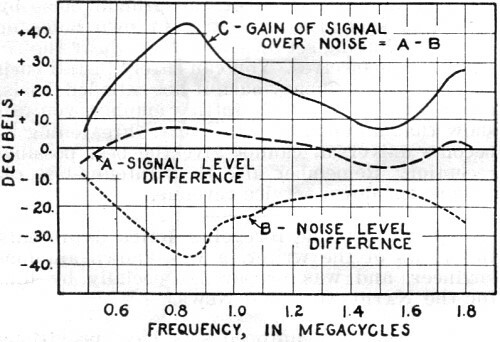 Curve C gives the resultant noise reduction for a given signal loudness, and represents the improvement in reception, which is as high as 40 decibels in some instances. Do you realize what this means? Well, it corresponds approximately to the adding or suppressing of a stage of audio amplification. In other words, it corresponds to raising or lowering the volume of an orchestra from piano to forte, or in piano playing, from mezzoforte to fortissimo. This represents the effect of an increase of about 100 times in signal voltage, as a reduction in the noise has the same effect as such a signal increase. How would you like to soften the interference in your radio receiver from an annoying forte to a tolerable piano level when listening to the New York Philharmonic Symphony on a Sunday afternoon, if you are a music lover? This would certainly justify the additional expense of a noise-reducing antenna. That is the argument to pass on to your customers. And so in conclusion: There's no substitute for the properly designed, perfected, noise-reducing antenna system, correctly installed. You can readily demonstrate the practical gain in signal strength and reduction of background noise by installing such a system in your own home or shop, and having set-owners come to hear the results for themselves. You can safely install such a system on a money-back-if-not-satisfied basis, for it does prove itself. In this manner, you can show that antenna-less receivers, threatening to become universal, cannot give the best possible reception. Remember also that antenna-less receivers cut down service revenue. Editor's Note: The foregoing article represents the views of the writer, a well-known antenna engineer, and was prepared especially by him for the National Radio News. Most of the loop-equipped sets have provisions for outdoor aerials. By connecting a good aerial to such a set when it is tuned to a distant station, you can demonstrate that signal level noticeably rises and noise goes down. Even holding a finger on the antenna post of many of these sets, while tuned to a distant station, will sometimes prove effective as a demonstration of the need for a good aerial when DX reception is desired. In a noisy location, only a noise-reducing antenna of good quality should be considered. Although the author made no mention of a specific antenna system in giving performance curves, we presume he is referring to one of the types manufactured under patents held by Amy, Aceves & King. The antenna kits sold by the Technical Appliance Corp., 17 East 16th Street, New York City, using the trade name Taco, are so licensed. Information on these kits may be obtained by writing directly to the manufacturer. Undoubtedly, there are other concerns making kits that will also perform satisfactorily in giving a good signal-to-noise ratio. A trial of several types should be made if possible, at your shop, to determine the best type for your particular location.